We are pleased to inform you that we are hosting another International Karate Seminar this year. We’ve invited the best in the world, with teaching from Saiko-Shihan Kazuyuki Hasegawa, Shihan Roel Wildeboer and Sensei Takuma Koketsu. Saiko-Shihan Kazuyuki Hasegawa was Kyokushin All Japan Champion in 1969, as well as one of the best students of Sosai Oyama. He is currently the President of Kyokushinkaikan World SoKyokushin. Shihan Roel Wildeboer (7th Dan) has more than 45 Karate experience and has been the champion of the Netherlands several times. He has a great knowledge of Kata, Bunkai, self-defence and Kumite techniques. 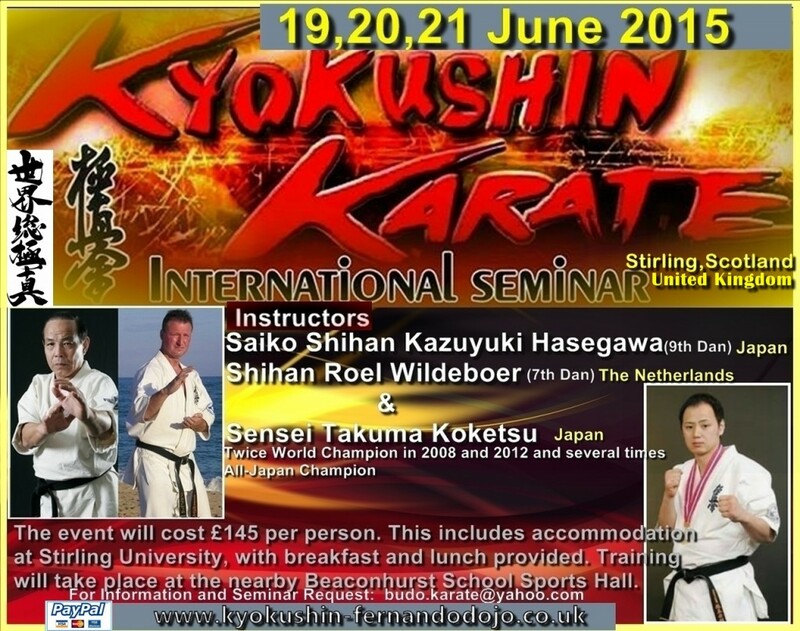 Shihan Wildeboer is the current representative for SoKyokushin Netherlands and an advisor to World SoKyokushin. Sensei Takuma Koketsu(3rd Dan) is one of the top student of Saiko-Shihan Hasegawa, twice World Champion in 2008 and 2012 and several times All-Japan Champion. This year the seminar will take place in Stirling, Scotland. Accommodation at Stirling University will be provided and training will take place at the nearby Beaconhurst School Sports Hall. The event including accommodation, breakfast and lunch will cost £145 per person payable by bank transfer, paypal or cheque, this is non-refundable. It will be dormitory style with five persons per room. We have 50 places at the University near to the training hall. After the first 50 people we will source additional accommodation but we cannot guarantee it will be as close to the venue. Please book quickly to ensure your place. We will hold Kyu and Dan gradings under Saiko-Shihan Kazuyuki Hasegawa, please contact if you are interested. We welcome all Kyokushin Karate groups and styles of knockdown Karate to attend and look forward to see you in Stirling, United Kingdom. Osu! invitation: For participants needing visa, thank you to understand for United Kingdom lows reasons that we can send official invitation for visa only if we receive: Filled and signed application for the seminar. The seminar fee must be paid in full before we will issue any official invitation letter.